I’ve learnt a lot about how I like to work/design during this process. Not just for tutus but many projects. In particular how much I enjoy detailed projects and slow sewing. I also embraced my inability to stick to a plan. I’m actually not a huge fan of ‘plans’ as I think you can be so doggedly pursuing a plan you might miss a magic opportunity. I confess I will take the longest, toughest road if I think it will take me where I ultimately want to be. What a long & winding road this stage was! I listened at the June tutu workshop and studied all the recommended plate decoration techniques – and then ended up simply doing what felt/looked right to me. I also considered my daughter’s physical build (slight) and how she dances (light on her feet) when considering my options. 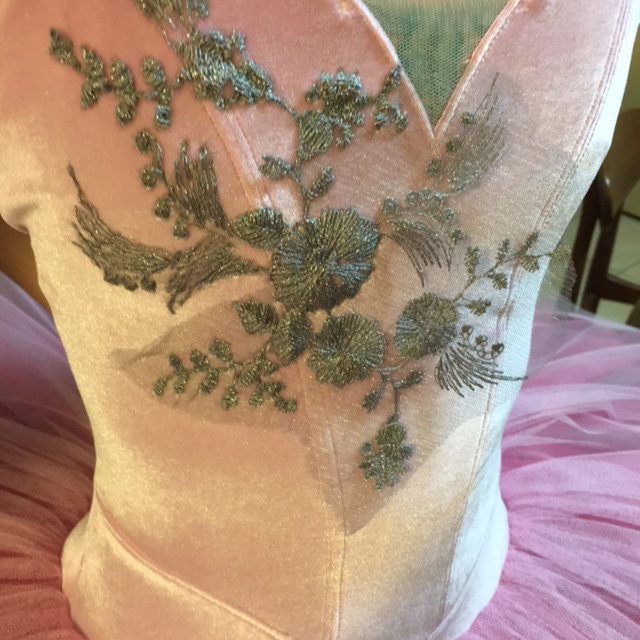 Often you would decorate the tutu by using the bodice fabric to create a plate that suits over the net plate, to ‘blend’ the bodice into the skirt. The proportions are covering 1/3 or 2/3 of the plate. I did this, hand sewed decorative braid to the edges… and hated it. It looked heavy and clunky. So I threw it away (saving the braid of course!). I think the pile of the velvet and how the colour changes as the light hits it didn’t help either. It just didn’t seem to blend with the bodice at all. I thought it made the bodice look like a quirky teacup! Tutu with lace overlay and velvet plate. this is the velvet plate folded in half but you get the idea! Sorry, I forgot to take a photo of just the velvet plate on the skirt – clearly that decision required no consideration! I also tried layering lace and various braids on and around the velvet piece but nothing worked. So I tried with just the lace. Despite the beautiful lace fabric, it looked heavy and dull gathered over the skirt. This had been my original concept. I happily threw it out the window – not the lace… just the idea! I trimmed the lace motifs away from the mesh fabric, sat them on the plate and pinned them on the bodice. Suddenly I was happy. I loved the look of the lace floating on the pink. I decided that the pink netting and bodice weren’t jarring together and blended nicely by running the lace from the bodice into the skirt/plate. It was the only decorative design I could settle on. Tutu with cut-out lace motifs. I loved this lace layout but the shape of the lace motifs didn’t lend themselves to an overall design. How to attach the lace? I tried glueing it to the flat net plate. Yuck. So messy! I didn’t like how it dulled the silvery tone of the lace eithe. I tried machine stitching, I didn’t like the visible stitches. So I tried hand stitching and trimming away the mesh – thanks Jen The Stitcher & Gatherer! Finally I was happy – and relieved! 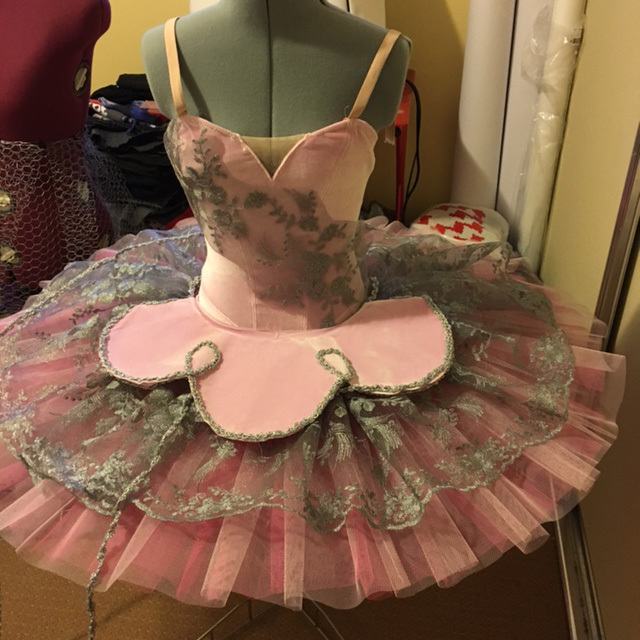 It achieved a pretty ‘floating’ effect and seemed to best suit the soft colours of the tutu. I used the scalloped edge of the lace fabric and the lace motifs of the fabric itself. These have been hand stitched into a flat circle of netting – with an oval cut in the centre around the leotard/bodice. 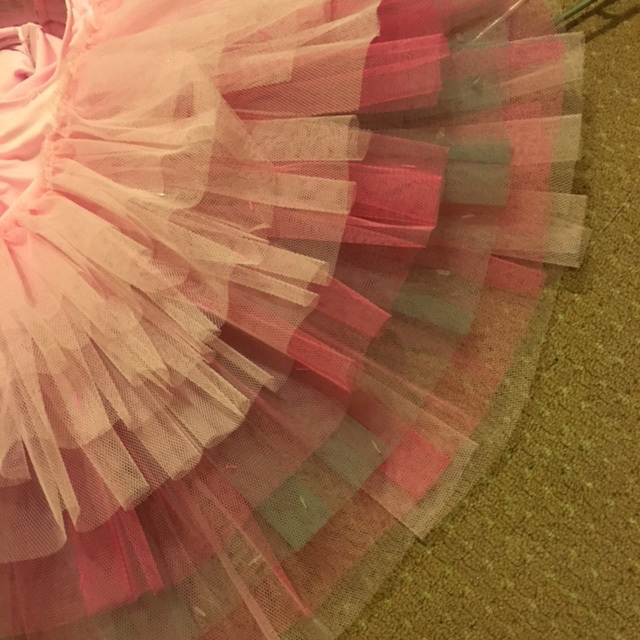 I focused on achieving the right shape around the outside of the net circle to match the tutu plate, I trimmed the waist ‘hole’ just before I attached it. Yes, it was a time consuming activity. I took the circle of netting to work and did a little stitching during my lunch breaks. My colleagues have long known I’m a bit of a sewing eccentric! I think they struggled to see how this flat circle of netting was going to become an integral part of the tutu! 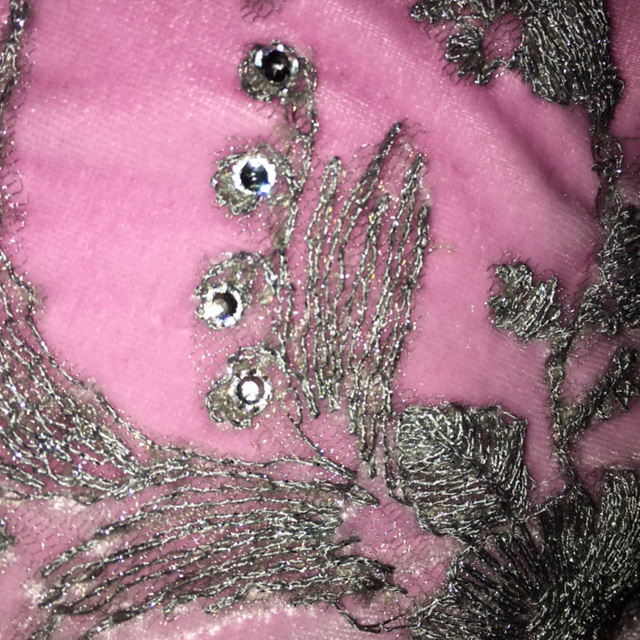 I attached the flat circle of embellished netting at the base of the bodice – but to the netting not the velvet. 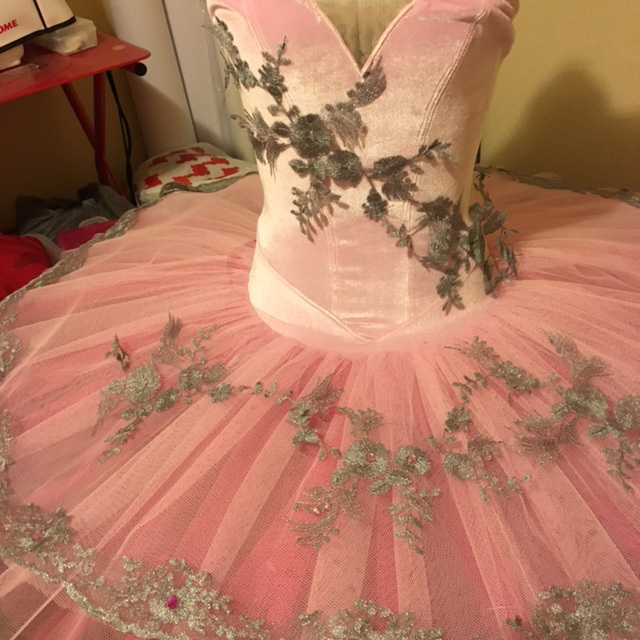 I also to the outer edges of the top tutu layer… with tiny individual stitches… yes, single stitches. This allows the waist the stretch a little without popping stitches and around the outer edge to keep the ‘lightness’. I attached the lace to the bodice trailing it across the bust and onto the skirt. My daughter loved the asymmetric sweep of lace across the bodice. It also suited the lace motifs which were not symmetrical and couldn’t not be mirrored down the bodice front as the wrong side was slightly duller than the right side. I made her try it on at this stage to check the bodice lace wasn’t doing anything odd when the velvet stretched. I laughed too. And felt relieved. The work was paying off! I left the lowest part of the bodice lace stitching until after I had attached the skirt decorative plate. This meant to could stitch the lace to trail onto the skirt and blend the two section together. I listened to the advice about glueing gemstones – which you can buy by in the hundreds at Spotlight quite cheaply – instead I bought a hot tip applicator ($22 from eBay – thanks to the advice of Stretchwear by Sam who sews for dancewear & for dance schools & I met at the June workshop) and invested in hot fix Swarovski crystals. I had played with what colored gems might look like but, for me, they added heaviness to the airy feel as well as introducing new pink tones. It might seem minor but I had an idea in my head of my lithe daughter appearing to dance in a piece of fairy floss that sparkles as she moves, with light shimmering on the grey/silver lace. That it wasn’t about the decoration as much as how the light hit her & reflected on stage. She’s very light on her feet and I wanted that quality to be reflected in a dainty, romantic tutu. My decorations aren’t so much about being a statement in itself. My decision was to make the delicate lace sparkle as she spins. Like frosting. I chose clear Swarovski crystals. And once the rest arrive, hopefully I will achieve the sparkling ‘frosting’ that is in my head. Swarovski Hot Fix Crystals. I ordered 100 – nowhere near enough! I have 1440 on their way from Hong Kong as I type! this bodice should have many, many more crystals attached to the lace soon. So hard to photograph velvet, lace & crystals! The difference between glueing or machine stitching the lace is minimal from a distance. Perhaps sparkle paint on the lace may have been just as effective. However I know and can appreciate the difference. And that’s enough for me. I wasn’t producing a commercial tutu for sale this was a labour of love. And so I stitched and I will fiddle for hours with tiny crystals and the hot tip applicator. Be prepared to change direction & be patient. I often left it on my dressform for days which I pondered the next step. I took lots of photos on my iPhone and poured over them in a gallery as this was the easiest way to compared visual changes to the design. 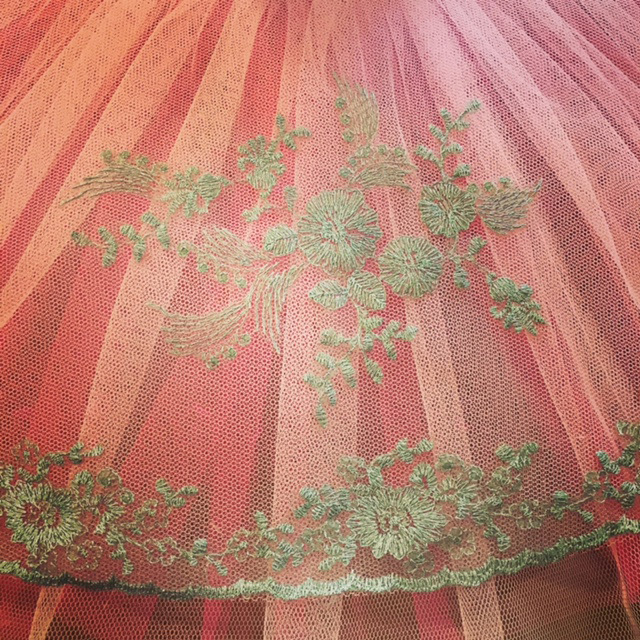 Decide whether your project, tutu or garment, is a fast or slow project. I embraced it as a labour of love & challenge so I poured a lot of time & thought into it. Not a commercially viable use of time BUT sewing is my hobby. So I indulged myself. I did sweat it out at the end as my daughter announced she would wear it to a dance school concert – and suddenly I had two weeks to finish! In many ways I am glad she did that. While I enjoy hand sewing… it was tedious work. This forced me to knuckle down and work to a deadline. Fortunately I had made my design decisions and had half stitched the plate lace. I set up the ironing board in the living room so I could stand while working and not be isolated in my sewing room. I tucked a piece of hard board inside the leotard to make the stitching easier. However I found the easier thing to use was a shallow stainless steel bowl – so I was stitching the lace onto a curve rather like the curves of a human body. All this work & thought! Is it perfect? Not by a long shot! It’s a learning process and I have enjoyed the challenges along the way (ok sewing the skirt not so much!). I’ve created something beautiful & useful. Something my daughter loves and feels great in – and something that makes me feel proud. The final tutu coming up next! 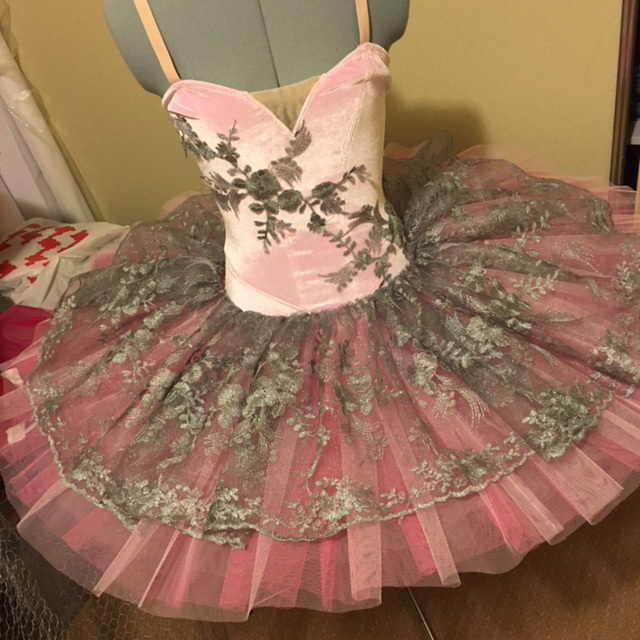 This entry was posted in Dancewear by sewbusylizzy. Bookmark the permalink. Wow, this is looking so beautiful. All your hard work is worth it. It has been hard work and towards the end my back was exhausted! But it is inspiring to see her dance across the stage and think ‘wow she’s beautiful and I made that’. This is beautiful! Your daughter will never want a store bought one again! Fortunately I do love embellishing things – but yes, I think she loves how individual her dance outfits now are so RTW is not appealing at all! Holy crap! This is actually amazing! I love how you positioned the lace, the effect is so beautiful! And there’s nothing like a deadline to ensure a project gets completed. Can’t wait to see the final result! The photos aren’t the best as the theatre lighting was difficult but it’s more about the fact it was finished! I spent ages worrying about how to finish it – and I’m glad I did as I feel like I made the right decision… eventually! It’s absolutely beautiful, a real work of art. Thank you so much. I’m still sort of stunned I managed to do it! It’s always been a dream project because I was so curious about how they were made. It’s just been a joy to see it come to life and be loved by her. Your post is fabulous! A really good description of the design process, especially about being willing to change your mind when things don’t work. I also love that you thought about what the final “effect” should be, rather than just going with your first thought. It’s hard to do something and just look at it and think ‘no, that’s not it’ and start again! But it was an interesting process to go through and to investigate all the different ways I could do something. I’ve had fun with the hot tip applicator and I can’t wait for the 1440 crystals to arrive as I think it will look magical. My daughter is quite tall and very lean for her age. So I just kept thinking about how she danced and trying to preserve that lightness in her tutu. 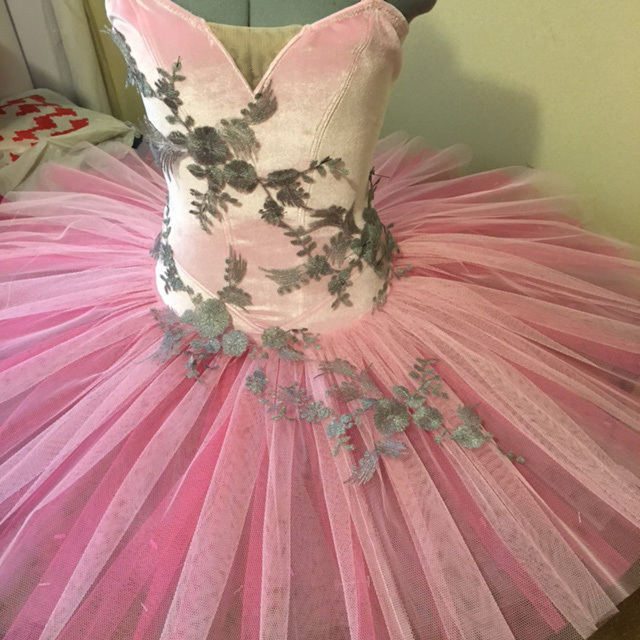 She actually hated the idea of pink/grey/silver but thought my first tutu would be dreadful anyway so let me have my way… she loves it and I just couldn’t believe how it transforms her when she wears it. Thanks so much for all your guidance and support at the workshop, it really was fabulous! A tip for thread tangles. Thread your needle with the end that comes off of the spool. Not the end you cut. Great tip! Thank you I’ll try that next time! Just reading this leaves me feeling exhausted. All that wrestling in the first post, and then hours of standing up. Hand sewing, glueing, it seems to go on. But… So worth it! Really beautiful. Can’t wait to see it on her in the finished post! You are simply amazing. What a wonderful labour of love. She will treasure it for years I’m sure, even after she’s outgrown it (which I hope won’t be too quickly). Every decision you made while constructing this tutu was the right decision to make it look light and glorious. Lots of work but absolutely beautiful. Lucky girl! I was surprised by how long deciding on the design/decorations took but it was worth the patience and frustration. I have so enjoyed reading about your process Lizzy! 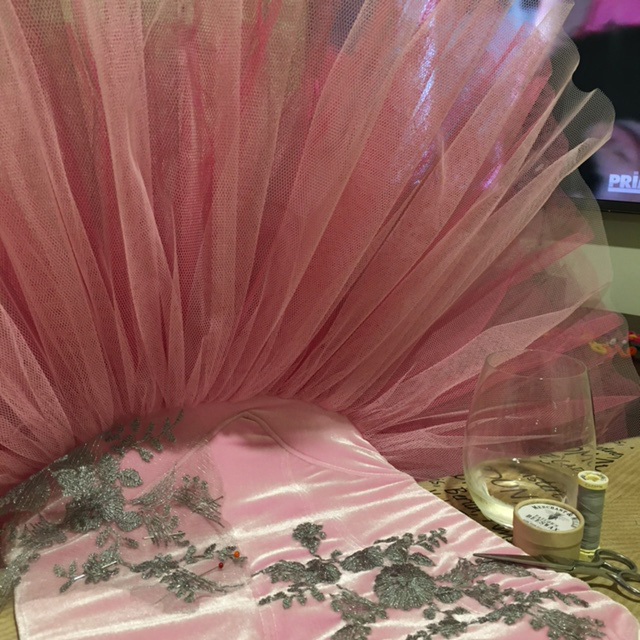 I’ve always been fascinated by tutu construction and you have done a beautiful job. I love all the decisions you made with the colours and decoration. Congratulations!